All of my friends, fans and rabid readers know by now that I am a huge horror fan. On my blog I write about our yearly October Tradition at Forto’s Fort on our 31 Days of Horror where we watch a different horror movie each night during the scariest month of the year. Recently, I was introduced to the works of Christopher R. Mihm and his genius in the horror/sci-fi genre by a friend of mine, Sid Korpi. I jumped at the chance to watch Mihm’s movies as soon as I heard about his work and ordered his first movie: The Monster of Phantom Lake (2006). The Monster of Phantom Lake flick is everything you would expect from Mihm. This B-movie is intentionally made to look like the cheesy drive in movies of the late 1950’s with corny dialogue and low budget set design. My favorite is the musical score. As they say in the film industry, movies are made in the editing room. Mihm and his crew hit the mark with great editing and beautiful syncing of music to entice the viewer into the story. Kudos! 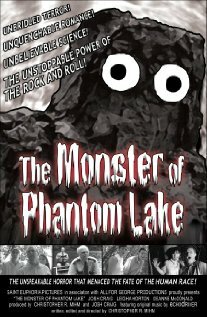 The Monster of Phantom Lake is set in the 1950s (I assume, but they don’t say) at a lake in Wisconsin. It follows a weekend camping trip of a group of teen-agers that just graduated high school, and a guitar picking, love-lusting Professor Jackson (Josh Craig) and is love interest/graduate student, Stephanie (Leigha Horton) as they are all thrust into the terror from a monster! The Monster is brought to life by a special form of algae, a crazed wife-killing World War 2 psycho-path, and a toxic mixture of Atomic Waste that is illegally dumped into the picturesque lake. It then becomes a race for survival for the teens and the Professor and his ever-willing pupil. While the plot sounds like the fear factor propaganda horror movies of the cold war era, The Monster of Phantom Lake brings its deliberate corny style to the 21st century in a style rarely seen in today’s films, replete with their billion dollar budgets and CGI special effects. I had no idea what to expect when I pressed play on the DVD but Mihm hit the mark with me. I loved the film and can’t wait to see the next one as soon as it arrives in the mail. Not that I’m biased or anything, but I share your affection for these new “old” classic drive-in-style flicks. I love them so much I stalked the director and landed a role in “Attack of the Moon Zombies,” which premieres May 25 in Minneapolis, MN! !